One of the things I’ve noticed in recent weeks is that my work benefits from organization. I’ve been a little out of sorts because I just packed up and moved across the country. We’ve been putting our new apartment together, and figuring out where everything goes. One of the last things that we put together was my office, so I had to work in relative disorganization for a couple of months. It hasn’t been pretty. Part of the issue is that we left my old desk behind in Utah. It was a true desk; it was a cheap plastic table that was cracking and not worth the cost of bringing it across the country. We decided to buy an Amish-made desk. It takes time to build furniture if you get it done by hand, and you want quality craftsmanship. This choice meant that I had to work from the couch, and that I didn’t have any place to put my office supplies. The desk has arrived, and it was worth the wait. But during the time I was without organization, it was hard to focus on my work. My productivity also suffered because I never knew exactly where everything would be, since there was no real place for it. Now, with my desk set up and my office supplies properly stored, I’m in a much better place with my productivity and my business. It’s nice to have everything where it belongs, and it’s nice to be able to sit at a desk and get my work done without having to hunt for what I need. Plus, there’s something to be said for having a clean and clutter-free work area. It’s also worth mentioning that clutter can be distracting. Better organization offers some advantages that can help you improve your productivity while you do your work. Clutter can distract you, and reduce your ability to concentrate on the task at hand. I know that I work better when my work area is organized and clutter-free. I feel like I have more space in my office area, which is important. On top of that, I’m not constantly thinking about the best, and how I should be cleaning it up. There are few things that can slow me down as much as seeing a disorganized mess out of the corner of my eye, and thinking that I really should clean that up. Being organized also helps me get into work mode. Better organization allows me to see exactly what I need to do that day. I have a prioritized list of projects to work on, and that organization allows me to tackle each item on my list in turn. It’s a big help, and it keeps me in work mode, to be organized at the beginning of the day. I can also look ahead to see what else is coming later in the week, which can also be a big help to helping me focus my efforts on my work. I also like having an organized workspace so that I can get myself into a working mood. Sitting on the couch, with my project list, a handy pen, and other items strewn about haphazardly just doesn’t really say “work” to me. I can complete my projects, and I made it work during the time I was without a desk, but I wasn’t nearly as productive. I’m working much better now that I feel like I should be “at work.” Mindset has a lot to do with how effective you are when you sit down to work, and being organized allows me to get into a work mindset. Better organization can lead to better productivity. Organize your workspace so that you know where everything is, and so that you aren’t distracted by clutter. 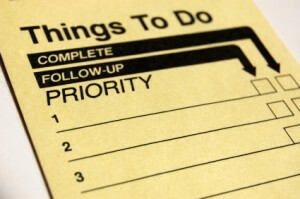 It’s also a good idea to organize your workday, making sure that the most important items are addressed first. I spent a day recently reviewing my processes and getting organized again after my desk was delivered. While it seemed like a lost day, since then, I’ve been so much more productive. I’ve been able to get a lot more done, and I feel like I’m ready to tackle just about anything.